Watch this unique video that shows Norwegian Escape’s new funnel being installed at the Meyer Werft shipyard in Papenburg, Germany. The funnel installation is part of the ship’s final phase of construction which also involves setting up all the public spaces by the crew and adding a third story to Norwegian Escape’s ropes course. 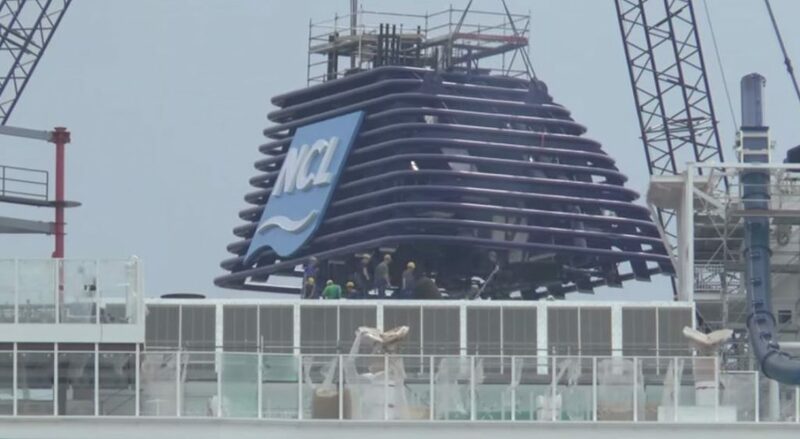 Work is still to be done but it will have to be completed before its delivered to Norwegian Cruise Line on October 22nd, 2015. Norwegian Escape was floated out onto the water for the first time on August 15th. NCL’s largest ever cruise ship also showed off its new hull artwork for the very first time by famed marine wildlife artist and conservationist Guy Harvey. The next major milestone for the 164,600 gross ton ship will be the conveyance down the river Ems towards the North Sea. The conveyance is scheduled for September 16th as long as weather conditions are in favour. Once the 4,200 passenger Norwegian Escape is delivered to NCL and completes its inaugural sailings it will end up at its new home in Miami, Florida. The ship will sail seven-day Eastern Caribbean cruises departing every Saturday from Miami beginning on November 14, 2015. You can view some stunning photos of the new ship while it was being floated out.